From the Ouragan evolved the swept-wing Mystere I that first flew in February 1951 with a Nene 104B turbojet. 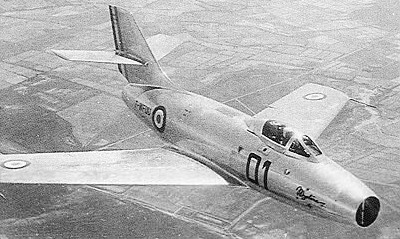 A progressive development of the basic MD.450 Ouragan, the first prototype, the Mystere I, first flew on 23 February 1951. It retained the fuselage, Nene engine and armament of the MD.450, with a new, sweptback (30 deg) wing and redesigned tail surfaces. Three more prototypes followed, differing primarily in power plant, two having the 2850kg Hispano-Suiza Tay 250 and the third having a 2500kg Atar 101C. 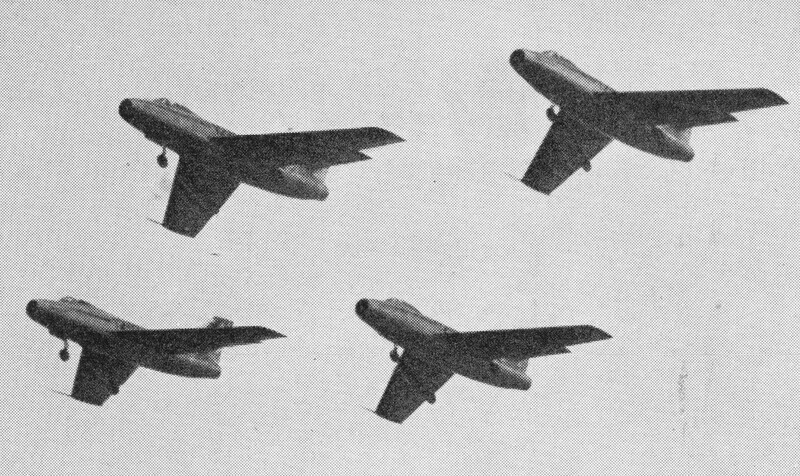 Eleven (later reduced to 10) pre-series Mystere IIs had been ordered in September 1951, and, of these, the first three and fifth were completed to the Tay-engined IIB standard, the third with twin 30mm cannon. The sixth and subsequent received a similar armament, SNECMA Atar 101C-1, -3, and later D-1 or -2 engine with revised intake trunking and rearranged fuel tanks as Mystere IICs. The first six of the initial order for 40 was added to the pre-series, the final two of these receiving the afterburning Atar 101F-2 of 3800kg. Production of an additional 90 Mystere IIC fighters was ordered for the Armee de l'Air, the last flying in January 1957. The series model featured increased tail sweepback, twin 30mm cannon and 2800kg Atar 101D-2 or D-3 turbojet. Flown in prototype form for the first time on 28 September 1952, the Mystère IVA was in fact largely funded by the United States, being subject to two large offshore procurement orders covering the manufacture of 325 air-craft in all. The prototype was powered by a Tay 250A turbojet as used in the Mystere IIA and IIB, and, in the following April, an offshore procurement contract (as part of US support for NATO nations) was placed for 225 Mystere IVAs. This was subsequently supplemented with a contract from the French government for a further 100 aircraft. Initial production versions were powered by the Hispano--Suiza Tay 250A turbojet engine rated at 2850-kg (6,283-lb) thrust, but this was fairly soon supplanted by the rather more powerful Verdon 350. Differences between the Mystère IIC and Mystère IVA models centred around the wing and fuselage structure, the wing featuring increased sweep and reduced thickness/chord ratio while the fuselage was much more robust. Integral armament consisted of a pair of 30-mm DEFA cannon in the forward fuselage below the cockpit but external ordnance such as 227-kg (500-lb) or 454-kg (1,000-lb) bombs and rocket pods could be car-ried when the type was operating in the tactical role. The first series Mystere IVA was flown on 29 May 1954, the initial batch of 50 retaining the Tay 250A engine of the prototype, all subsequent aircraft having the 3500kg Hispano-Suiza Verdon 350 (licence-built Tay). Basic armament comprised two 30-mm cannon. Introduction to the operational in-ventory came during 1955 when the Mystère IVA began to enter service with the 12e Escadre at Cambrai. However, the advent of the Mirage in the early 1960s resulted in the Mystère IVA being progressively relegated to second-line training duties during that decade. Of the 275 Verdon-powered Mystere IVAs produced, 60 were supplied to Israel, with deliveries commencing April 1956, and a further contract for 110 was placed by India with deliveries commencing in 1957. The Mystère IVA saw combat action with both of these nations. 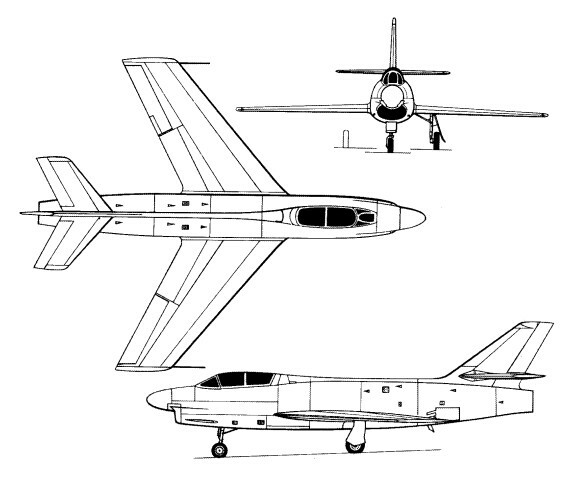 A process of aerodynamic refinement of the Mystere IVA led to the Mystere IVB, which, in fact, shared only wings, horizontal tail surfaces and main undercarriage members with the earlier model. The Mystere IVB was intended for an afterburning SNECMA Atar 101G axial-flow engine in place of the non-afterburning centrifugal- flow Tay or Verdon. It featured an entirely redesigned fuselage of increased fineness ratio, an upper engine air intake lip for the radar ranging aerial in place of the splitter-plate conical body and a lower-mounted horizontal tail. The first prototype was flown on 16 December 1953 with a Rolls-Royce Avon RA 7R engine developing a maximum afterburning thrust of 4330kg. Two additional prototypes followed, the first of these, powered by the Avon RA 7R, flying on 18 June 1954, and the second, with an Atar 101F-12, flying on 31 March 1955. Of seven pre-series Mystere IVBs completed, the first two each had a SEPR 66 bi-fuel rocket motor to augment the thrust of the Atar 101F engine, and the final two had the Atar 101G-2 engine developing an afterburning thrust of 4500kg. The series Mystere IVB was to have been powered by an Atar 101G-31 rated at 4700kg with maximum afterburning, but the programme was cancelled owing to the superior performance potential of the Super-Mystere B2. Having almost completed all Ouragan contracts for the Armde de PAir, for the Indian Air Force (where 71 are in service under the name Toofani), and against off -shore orders, Dassault were beginning to turn out Tay- and Atar-powered Mystere 2s in 1955. These were be followed by the RA.7R-powered Mystere 4B and the 4N. 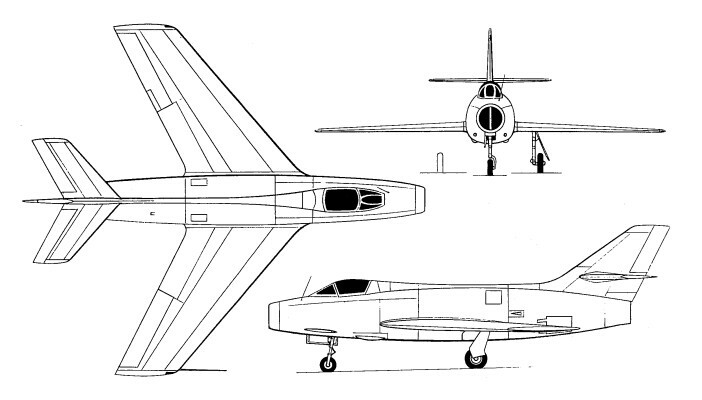 The first prototype 4N was being assembled; it looks much like a Sabre F-86D with two tandem seats and has a single-piece "all-flying" tailplane and full radar interception fire-control. Total production numbered 421 by the time the assembly line closed in late 1958 and, since they were funded by American money, most of the survivors have been re-turned to USAF control for disposal. Armament: two 30-mm DEFA cannon, plus two 454-kg (l,000-lb) or four 227-kg (500-lb) bombs, or two pods each containing 3637-mm (1.46-in) rockets.